One of the joys of delving into the world of “forgotten books” is that there are so many hidden gems waiting to be discovered. Over the years, I’ve come across quite a few as a result of following Pretty Sinister Books –- examples that spring to mind include Q. Patrick’s The Grindle Nightmare, and Claude Houghton’s I Am Jonathan Scrivener. In writing The Golden Age of Murder (Harper Collins), I tried to offer fellow enthusiasts a guide to a range of books produced by members of the Detection Club in the Thirties, as well as talking about the authors’ lives, the real life crimes that inspired many of their novels, and the way the times in which they lived influenced their work. My latest book, The Story of Classic Crime in 100 Books (British Library) has a different angle. I’ve tried to offer a fresh look at the way in which the genre evolved over the first half of the twentieth century. 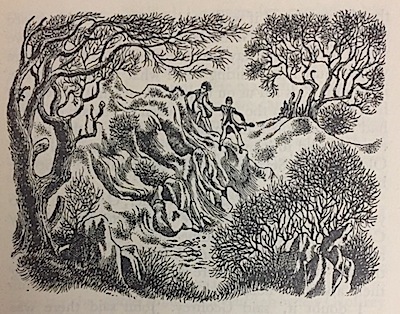 The approach is broadly chronological – from The Hound of the Baskervilles to Strangers on a Train (and wow, mention of those two very different books illustrates the remarkable scale of that evolution over fifty years!) – but along the way I examine a variety of themes. So there are chapters devoted to stories about impossible crimes, country house mysteries, and so on. Conan Doyle’s novel, and Highsmith’s masterpiece, are exceptionally famous, but there are plenty of titles which I hope will come as a surprise to readers, however well-versed they are in the genre. The Medbury Fort Murder by George Limnelius and Death on the Down Beat by Sebastian Farr are just two examples. This is, after all, not a list of “the best” (supposedly) or even my own special favorites, but rather a book that focuses on an eclectic mix of novels (plus a smattering of short story collections) with a view to telling a story. Some of the choices may seem controversial, or even just idiosyncratic, but I hope that readers who come to the narrative with an open mind will find that the selections make sense – kind of! We will see. The Story of Classic Crime in 100 Books will be published in the UK on July 7 by the British Library, and in the US on August 1 by Poisoned Pen Press. This Friday there will be no Friday's Forgotten Book. 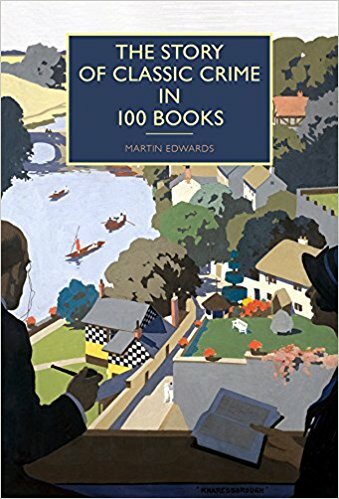 Instead I'll be one of the ten participating bloggers in a promotional web tour for the upcoming release of Martin Edwards' The Story of Classic Crime in 100 Books. Similar to 1001 Midnights and the more recent Books to Die For Martin's survey of overlooked detective and crime fiction addresses decidedly obscure and utterly forgotten books in the genre which nevertheless helped shape the evolution of what we know as the modern crime novel. Below is the full schedule with links to all the blogs. As the posts continue to appear over the next week and a half I'll update the links to take you to the specific post of n the tour (Right now they go to the blog home page). All of the posts were written by Martin himself and are designed for each blog and its particular audience. The post for Pretty Sinister Books talks about our mutual obsession for obscure detective fiction and how my blog helped contribute to the creation of the book. Quite an honor, I think! One post will be written by the blog host -- Margot Kinberg ("Confessions of a Mystery Novelist") -- who will interview Martin. That one ought to be one of the more interesting pieces to read. Hope you stop by to read each post and get some insight into why Martin wrote the book and how it came into being. The Story of Classic Crime in 100 Books will be released on July 6 in the UK and August 1 in the US. Pre-orders via internet bookseller sites are, of course, available now. One of the serendipitous rewards of having created this blog is discovering another side to a writer I am already familiar with. 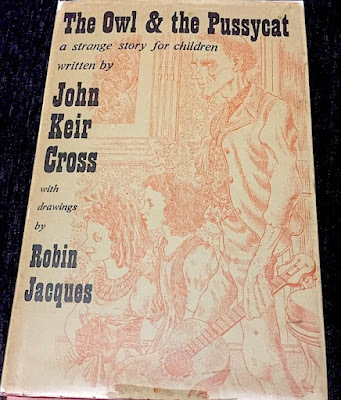 Take the case of John Keir Cross, an obscure Scottish writer whose collection of strange and supernatural fiction The Other Passenger I thought was his only noteworthy book. 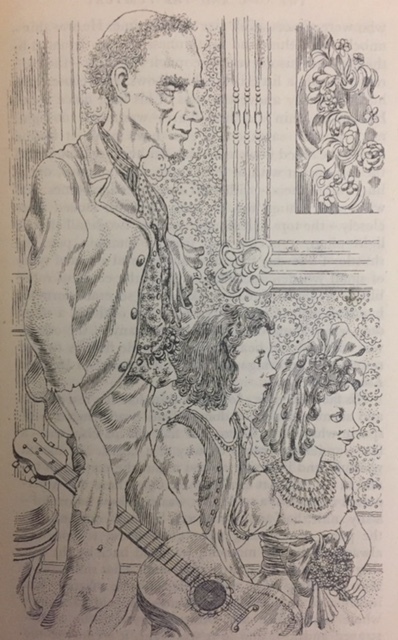 In researching his work as part of my preparation for a foreword to the upcoming reissue of The Other Passenger from Valancourt Books, I learned that the bulk of his work was in children's fiction under his own name as well as his fictional alter ego of "Stephen McFarlane." He wrote a mix of science fiction, detective novels and fantasy for children with much of it published only in the UK. 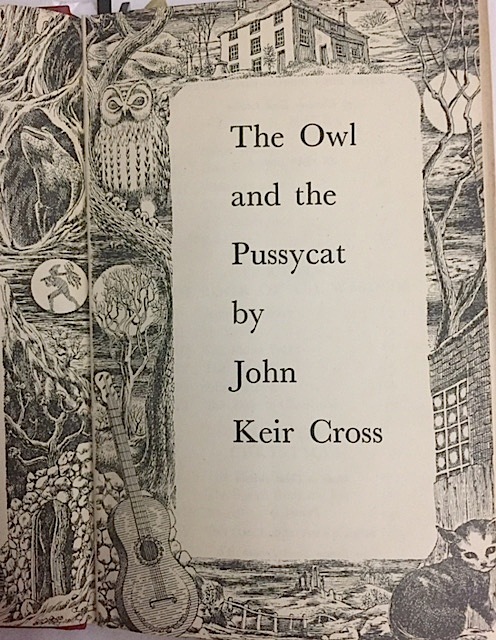 One of the more obscure books published in both the UK and the US is The Owl and the Pussycat (1946) reviewed here under its more familiar US title The Other Side of Green Hills. Also, I thought I would arouse your interest using the US title since the original one is an allusion to the well known nonsense poem by Edward Lear and might cause a bit of confusion as it did me. Green Hills is the name of a house in the Scottish countryside where several children are spending their Christmas holiday. The "other side" refers to an elaborate alternate dimension on the grounds where the Owl and the Pussycat live. These are not literally two anthropomorphic creatures as in Lear's poem, but an elderly violin playing gentleman and his companion, a little girl about ten years old. The focus of the story is on Geraldine, one of the youngest of the children spending her holiday at Green Hills. It is her uncanny ability to penetrate the Other Side that allows all the children to see and speak with the Owl whose real name we never learn, and the little girl known only as Pussycat. Sounds a bit too strange already, right? I was reminded of C.S. 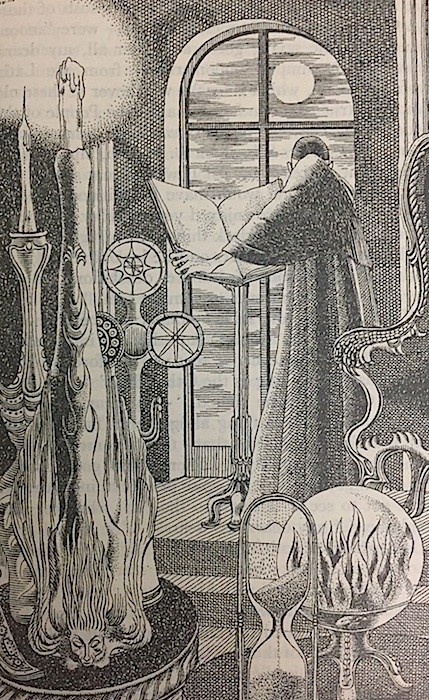 Lewis' Narnia Chronicles in which another world is accessible through that magical wardrobe located in Professor Kirke's massive home. In The Other Side of Green Hills Geraldine first discovers the alternate universe when she falls into a secret basement after uncovering a trapdoor in a cottage she and her friends are exploring. After being rescued she claims that she was pushed though no one was anywhere near her as she is told by the older children in the group. Later when all the children are visited by the elderly eccentric Owl and the angelic, forever young Pussycat we learn that there are weird creatures known as Moon People who are the enslaved minions of the wicked sorcerer Titus. They are trying to kidnap Geraldine for an unknown purpose. The elderly Owl knows why, but is too terrified to reveal the secret of Titus' motives until it is almost too late. The Owl talks a lot about the concept of paradox which he first introduces to the children in an optical illusion included in the many macabre illustrations done by artist Robin Jacques. 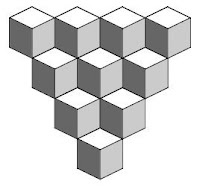 He explains this familiar drawing of cubes done in black and white (see illustration at left) as a tool in appreciating how the Other Side exists. "It all depends on how you look at it," he tells the children." Then -- as he so often does -- the Owl bursts into song: "Look once, look twice./Look round about --/And in a trice/What's In is Out." Staring at the drawing the children discover that the cubes look as if they are going in or rising out of the paper. 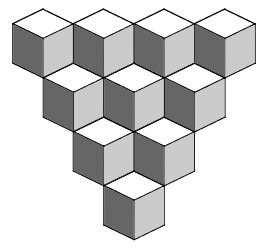 And this is also the key to understanding how adults are unable to see into the Other Side or be visited by any of its occupants. Adults, of course, grown too lazy in their thinking and accustomed to their grown up ways tend not to have the ability to see differently as do children the Owl explains. 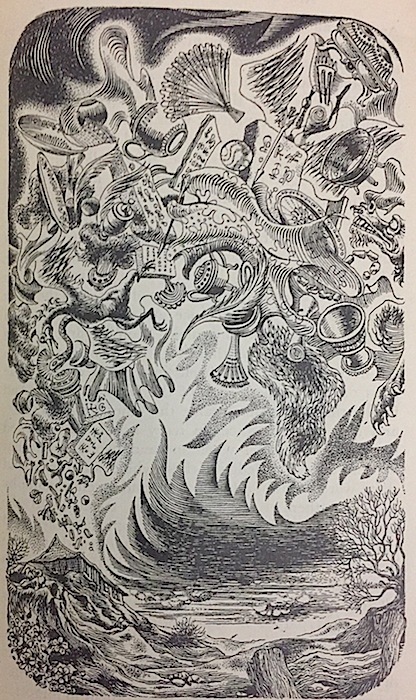 Though the story begins with a lighthearted fantastical tone as The Owl regales the children with anecdotes of the Other Side, and revealing his philosophy of life through a series of songs with seemingly nonsensical lyrics, much of the story descends into a dark realm atypical for a children's book of the 1940s. The story will turn into the age old battle between good and evil, innocence and experience, with the children helping rescue Geraldine from the clutches of Titus and the Moon People. Eventually the Owl will divulge the secret motivations of Titus and his search for missing pages in a Book of Secrets the children find. The story is imbued with an increasingly eerie atmosphere, magic rarely is used for good, and the reader cannot help drawing an analogy with the battle that takes place in the climactic pages as a fantastic rendering of post World War 2 England after the Blitz. Interestingly, these eccentric fantasy characters and incidents echo what is found in Cross' strange adult stories of wanton cruelty, inescapable violence and haunted individuals who populate the pages of The Other Passenger (1944). The theme of an alternate world is explored more metaphorically as characters discover they are trapped within their cursed interior lives. I'll have more about that book in the coming months along with news about its reissue and release date. JJ at "The Invisible Event" has revived the once somewhat regular meme on the vintage mystery blogs in which participants ramble on a particular topic. This month we talk about our favorite book by a writer who we don't care for or have avoided over time because we just don't like his or her style of mystery writing. Took me a while to come up with one for this because most bad mystery writers in my experience don't really have much to recommend in their overall work unless you want to read the books as self-parodies or "Alternative Classics." But that's not the point of this week's topic. So I had to reach back in time to remember one single book by a writer who I just don't read anymore because... well... frankly he bores me to death. 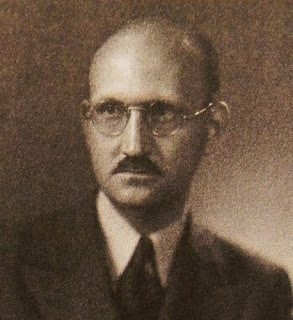 And that's R. Austin Freeman. Freeman as we all know was a pioneer in the scientific detective short story and also the inverted detective story. He also wrote several inverted detective novels but only one of them stands out in my mind as something rather remarkable. The Shadow of the Wolf (1928) is one of his more complex mystery novels loaded with the kind of arcane scientific talk (like a long dissertation on the formation of barnacles on a ship) that aid Dr. John Thorndyke in tracking down his elusive murderous prey. And yet despite what might have been yet another droning, boring book I found it utterly fascinating. There's a paradox worthy of Father Brown. It's one of the few Thorndyke novels that I found truly suspenseful. 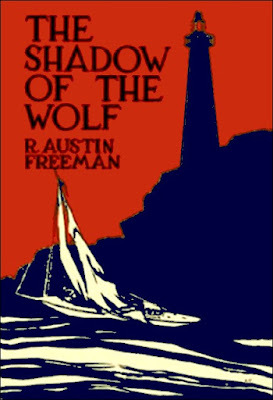 Another of Freeman's inverted detective novels we therefore know the identity of the murderer in The Shadow of the Wolf from the outset. Thorndyke's methods, however, are so odd and unusual in this novel, a nautical mystery about ships and the sea, that I was transfixed. 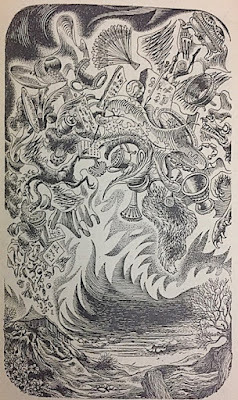 I tend to write a lot about the "Things I Learned" in books of this type and there is a lot to fill the head of the insatiably curious reader in The Shadow of the Wolf. I rarely go back to Freeman's books because they belong to an old-fashioned type of detective story that no longer excites me. His obsession with all things related to Egyptology gets tiresome; his characters don't ring true as human beings to me; and his often stodgy prose hasn't aged well. But I will always recommend The Shadow of the Wolf for its faster than normal pace (for Freeman, that is), its unusual subject matter, and a story that unravels with true suspense and a couple of thrilling surprises. 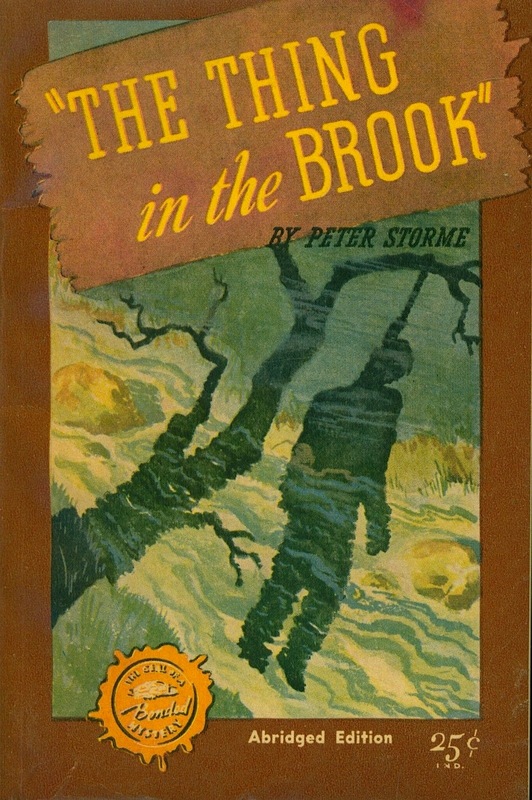 THE STORY: Biologist James Whitby's scientific studies are interrupted when he inadvertently becomes one of two men who discover the grisly body hanging from a tree above the brook in the rural village of Brookdale. The victim, a much loathed local, was strangled, bludgeoned and then hanged. Someone definitely wanted him dead. Could this be another victim of the legendary thing that is said to haunt the waters of the brook? What happened to that young woman so many years ago? Her clothes were found in a neat pile by the bank but not a trace of her body ever turned up. THE CHARACTERS: Whitby narrates the story, but he's not at all interested in solving the baffling crime of a thrice murdered victim. He'd rather attend to his involved study of the local Myxomycetes. That's slime mold to all us non-scientific schmoes. Slime molds! You'd think that this was a parody of detective novels the way the opening chapters play out. What with Whitby's reluctance to cooperate with the state troopers, the motorcycle cop who keeps showing up to interrogate the villagers, and Whitby's overeager house guest Henry Hale (a murder mystery addict and budding amateur criminologist) sticking his nose into the investigation like some junior Philo Vance. There is a wry humor that pervades the story, but the plot turns very grim and serious by the midpoint. So is it a parody? Not really. A homage to the intuititionist school seems more likely. Despite frequent deprecating allusions to fictional detectives like Lord Peter Wimsey and Vance, Whitby fails to deter Henry from his goal of uncovering the identity of Howard Stanton's killer. Two more deaths will occur before the surprising finale. Hale is sort of a run-of-the-mill amateur sleuth that you find in numerous American mystery novels of the mid-1930s. I was reminded of the Patrick Quentin and Jonathan Stagge novels because the of the bizarre nature of the murders, the creepy atmosphere, the legend of the "thing" of the title, and a slightly macabre obsession with murder and occult phenomena. Leading me to the most interesting character of the book -- Mr. Marigold, an overweight, florid man of middle age who lives alone with his cat Herman. Marigold regales Hale with a litany of grotesque murders from the annals of crime reveling in the lurid details of violence and unusual weapons employed from medieval times to the post-WW1 years. Later, Marigold discusses his interest in psychic research with Whitby. INNOVATIONS: There is a strong hint that something paranormal is going on in Brookdale, but sadly this never really pans out. Still, the story has a neat resolution that may raise a few eyebrows and frustrate traditionalists in its iconoclastic disregard for the finer rules of detective novel writing. Storme clearly seems to be inspired by Van Dine and Quentin in his plotting and detective novel structuring. Hale calls himself an intuitive sleuth and not a true detective. He spends much of his time looking for the "psychological pattern" of the crimes foreshadowing the kind of criminal profiling techniques that become very popular in late 20th century crime novels. Hale relies perhaps too much on inference and intuition and does not impress the police even in his long lecture in the final chapter (teasingly titled "Parlor Tricks") when he reveals the truth. Captain Macready reminds us all that guesswork has no place in real police work when he warns Hale, "You'll need better evidence than that." And yet all along Storme has done an admirable job of supplying the reader with subtle clues -- mostly presented in character sketches and dialogue -- so that he too can come to the same conclusion as Henry Hale. The revelation of the motive and methods of the murders may break a couple of rules for traditional detective novels, but I'll give Storme bonus points for subverting the genre just when it needed shaking up. THE AUTHOR: "Peter Storme" wrote only one detective novel. His real name was Philip Van Doren Stern, an American historian and short story anthologist who wrote several non-fiction volumes on the Civil War as well as editing a collection of Poe's writing (both fiction and non-fiction) and a noteworthy ghost story anthology. In addition to his writing Stern made a living in the publishing industry working as an editor for Simon & Schuster, Pocket Books and Knopf at various times throughout his lifetime. Stern's claim to fame, however, will always be his short story "The Greatest Gift" which has been immortalized on film as the Christmas classic It's A Wonderful Life. EASY TO FIND? At one time it was fairly easy to find either of the two US paperback editions of The Thing in the Brook (1937). But as with the majority of books I enjoy and like to write about this title is becoming increasingly scarce in all its editions. As far as I know there is no UK edition of this book. The original US first edition (Simon & Schuster, 1937) is practically a rare book these days as I found only two copies for sale online. 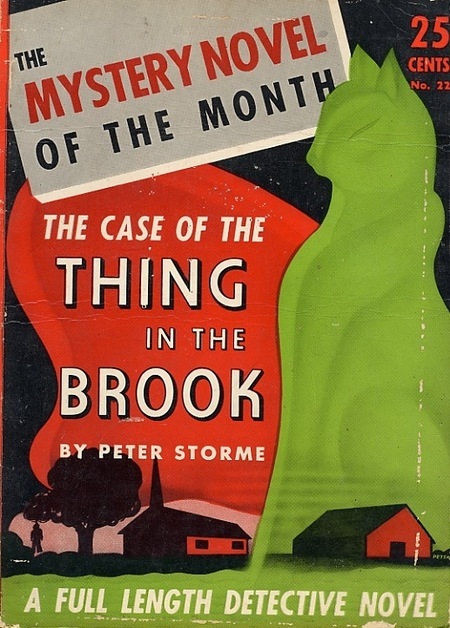 If you do go looking, you will increase your chances of finding a copy knowing that the digest paperback edition was retitled The Case of the Thing in the Brook which was reprinted in 1941.